It was a rough start to round two of the Battle of the Boroughs as the Knicks hosted the Nets last night in the Mecca. The Knicks were looking to end their 5 game losing streak after they kicked off the season with an offensive explosion on opening night. The beginning of the game as ugly as it was bascially a 3-point shoot-out. The Nets got off to a quick start, hitting their first 4-6 from beyond the arc. The Knicks struggled the find the bottom of the rim in the early stages, needing to scratch and crawl their way back to tie the game after the first quarter. Frank Ntilikina came out strong hitting his first two 3-pointers to get the Knicks back into the game. The rest of the Knicks followed Frank’s lead to get back into the game. Timmy was himself, stroking it, Vonleh had a posterizing dunk on Jarrett Allen after he himself got dunked on. Kanter came off the bench in a leading role and quickly had himself a double-double within 5 minutes it seemed. The Knicks then turned up the defense after the first quarter and shut down the Nets. It also helped that after the Nets, who started 4-6 from 3 range, cooled off and were 1-16 from 3. The defense fed off the offense and the Knicks took over the game. There were many bright spots for the Knicks last night. Frankie Smokes had by far his best game of the season with 16 points, 5 rebounds and 4 assists. He was also great on the defensive side of the ball, with active hands and being disruptive. Damyean Dotson was also playing lockdown defense as even Clyde mentioned Dot was having a very impressive defensive game. Mitchell Robinson had his best game of the season as well. He came out hot in the second half after only playing 6 minutes in the first half. In the first few minutes of the second half Robinson had a steal which led to a monster dunk that had the bench erupt. Robinson was 5-5 from the floor, but still needs to work on his defensive skills as it showed when he had a few bad break downs. Before the game, Robinson got help from former Knick and good friend of coach David Fizdale, Rasheed Wallace. Wallace mentioned he was intrigued by Robinson and willing to help him improve. Last night was a very good team win. Timmy led the team with 25 points, as he was one of seven Knicks in double figures. The New York Knicks beat their cross-town rivals 115-96. 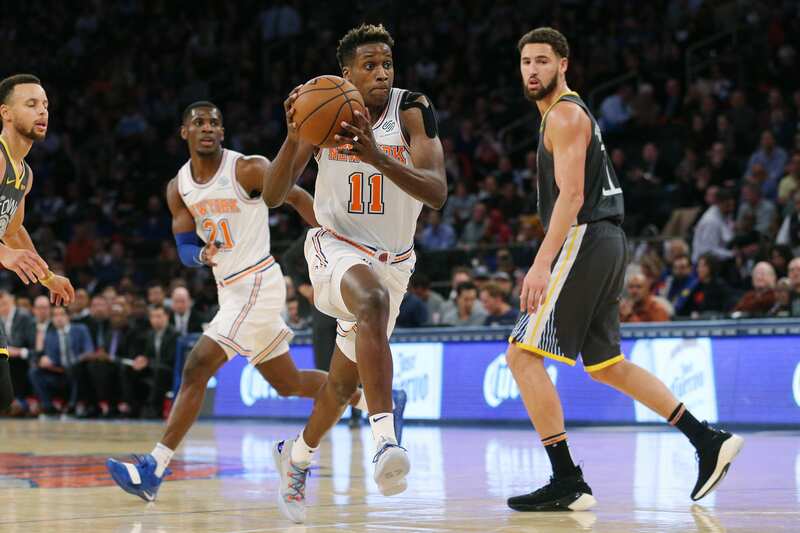 The Knicks will need to bring that defensive intensity and grit from the second half on Wednesday as they will host the rival Pacers at the Garden.